This chapter aims to highlight some aspects linked with the psychological interventions adaptability to the virtual setting, focusing on advantages, limits, and the effectiveness criteria of an online intervention, and of the virtual reality (VR) applications in the clinical psychology field. First of all, the authors will examine the characteristics of the web-based setting and of the online psychological counseling service, underling opportunities and risks of text talk-based chat therapy and the issues dealing with the role of the therapist. This will be followed by the analysis of Twende! Project, an online psychological counseling service created by the Italian company Idego – Digital Psychology s.r.l. 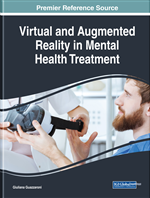 The chapter will conclude with the presentation of VR systems as an e-therapy tool, considering their application scopes in order to treat mental disorders and showing their adaptability and operational effectiveness in several clinical psychology areas. The coming of computers and social networks has radically changed the traditional communication system – regarding human interaction and the way in which its premises are conceived -, which is becoming more accessible, fast and efficient. This is developing unprecedented opportunities to create psychological areas suitable to cultivate human relations. Until the new communication technologies appearance (Baldini & Balestrini, 2005), the social interaction norms (punctuation, sequence, canons, codes) have become stratified over the centuries without special modifications. The new means of communications have also led to the denaturalisation of the social relation, expanding human biological limitations and sense organs. Among the effects of the technological development, the authors observe the transformation of several kind of works. In the psychological field, beyond the questions raised by the information technology development (Tonioni, 2013), there are an increasing number of innovative tools and resources in medicine and clinical psychology area of interests. In fact, there is an aspect, linked both to the market and to the society more in general, that may renovate deeply the profession of the psychologists with unexplored possibilities: this is the communication technologies use in order to provide psychological services. Currently, the arrival of new software and devices consists in a new opportunity to apply the cybertherapy in an economic way, reaching several patients and improving living conditions and mental health. In this sector, the Digital Psychology as research area considers how human beings behaviour and psychological moods are influenced by the new media; moreover, it examines the way in which the technology may be designed in order to integrate the human beings strengths and weaknesses (Riva, 2014). In the incoming future, this branch of psychology will play an increasingly central role with the aim of knowing and knowing to plan the technologies so that they support the psychological well-being. In order to explore these issues, this work will present a review of the recent advances in applying the new media in the psychological and psychotherapeutic field and it will underline some aspects linked to the clinical psychology adaptability to the different virtual settings. The Authors primary aim in this area of research is to update the psychological culture, in order to deal with the psychological disease considering the most recent transformation of the social, cultural and economic fabric. In the next years, Virtual Reality Apps and software will be more and more frequent for what concerns telemedicine and mental health. The adaptability of psychological interventions to the web mediated setting will be analysed, in particular examining its application fields, its advantages and disadvantages and also the standards of evidence of a web-based intervention. The Authors will advance the idea that the Virtual Reality (VR) systems represent a credible, realistic and efficient outlook in the clinical psychology field. It will be presented the case of IDEGO – Digital Psychology, an Italian social reality, established by the Authors of this chapter, which has fostered several projects in the areas of interest of e-Health, online psychological counselling, Virtual Reality, in order to support the practice of psychologists, psychotherapists and other professionals, working in the fields of mental health, psychotherapeutic practice, psychiatric rehabilitation and sport psychology. These issues will be explored by the on field experience of the Authors in this sector, offering causes for reflection about the best practices at the base of the web-based interventions planning. In this context, the Authors will first present the planning methodology of Twende! Online Counselling, an online psychological counselling service, using the web and the chat as tools to reach the new generations through the Psychology. This will be followed by a real case of a VR system for the therapy of psychosis, created by the Authors in collaboration with the Tor Vergata University of Rome: “Tor Vergata Virtual Reality Rehub”. Immersivity: The peculiarity of VR systems of simulating reality in such a way as to make the user feeling the illusion of being part of it. Non-Verbal Cues: Visual signs typical of the face-to-face communication associating with the words. Body language, tone, gestures, facial expressions. Medium-Transparency: The property of the digital tool of creating an immersive reality without being aware of the presence of the technological device itself. Digital Native: Coined by Mark Prensky in 2001, the new generations characteristic of being immersed in the web-based technologies. Virtual Reality: A web-generated tridimensional environment, which is immersive, interactive, and experienced through the use of special technological devices. Chat Therapy: The provision of psychological services through remote communication technologies employing instant messaging tools. Protective Shield: The function of promoting the self-disclosure of a person in the web-based communication.